To make the students understand and interpret drawings of machine components so as to prepare assembly drawings either manually and using standard CAD packages. To familiarize the students with Indian Standards on drawing practices and standard components. 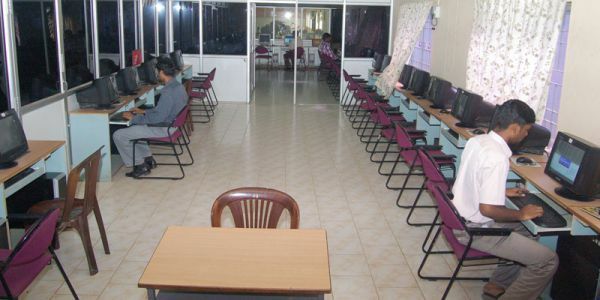 To gain practical experience in handling 2D drafting and 3D modeling software systems. The Lab has 60 Nos. 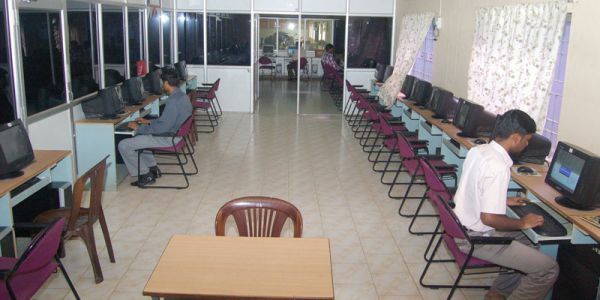 of high end desktops connected in LAN, Switch based network for speedy internet access, High end software like CATIA V5R9, Pro-E, IDEAS 9.0, ANSYS 5.7.1, ARENA 10.0, SOLID WORKS 2006, UNIGRAPHICS NX4 (CAD), AND AUTODESK INVENTOR SERIES 5.3. 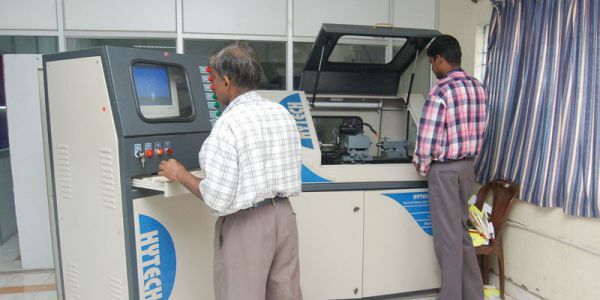 To understand the basic concepts of computer numerical control (CNC) machine tool and CNC programming. 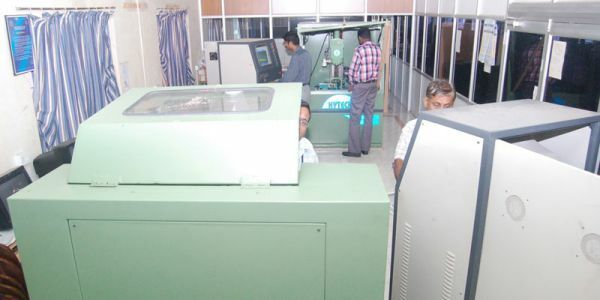 The Lab has Production model CNC lathe and CNC milling machines with CAM simulation software’s like CMAS, Edge CAM 10.75, Unigraphics NX4 (CAM), and Falcon make ROBOT – RCS – 6. Dynamics and vibrations laboratory equipped with universal governor, whirling of shaft, gyroscopic couple and other various mechanisms. The student is introduced to the mechanics of fluids through a thorough Understanding of the properties of the fluids. The dynamics of fluids is introduced Through the control volume approach which gives an integrated understanding of the Transport of mass, momentum and energy. The applications of the conservation laws to flow though pipes and hydraulics machines are studied. The steam laboratory is equipped with a steam boiler, steam turbine, condenser and cooling tower system which can give the students a glimpse of industrial environment. Fuels laboratory is equipped with Pensky Martin Apparatus, Say bolt Viscometer, Redwood Viscometer, Orsat Apparatus and Bomb Calorimeter. To understand the interdisciplinary applications of Electronics, Electrical, mechanicaland Computer Systems for the Control of Mechanical and Electronic Systems. IC engines laboratory with a fleet of two stroke and four stroke, diesel and petrol engines, single stage and multi stage compressors, constant and variable speed blowers. This lab is equipped with different shops. Fitting and Carpentry shop is equipped with various fitting and carpentry devices and tools. Smithy Shop is equipped with charcoal fired furnaces, power hammers, anvils, different types of sledge hammers, swage blocks, tongs, etc. Foundry shop has moulding and casting tools and accessories like green sand, mould board, different types of hammers, trowels, types of patterns, etc. Welding shop has arc welding and gas welding equipments with fitting and bench grinding machines, etc.